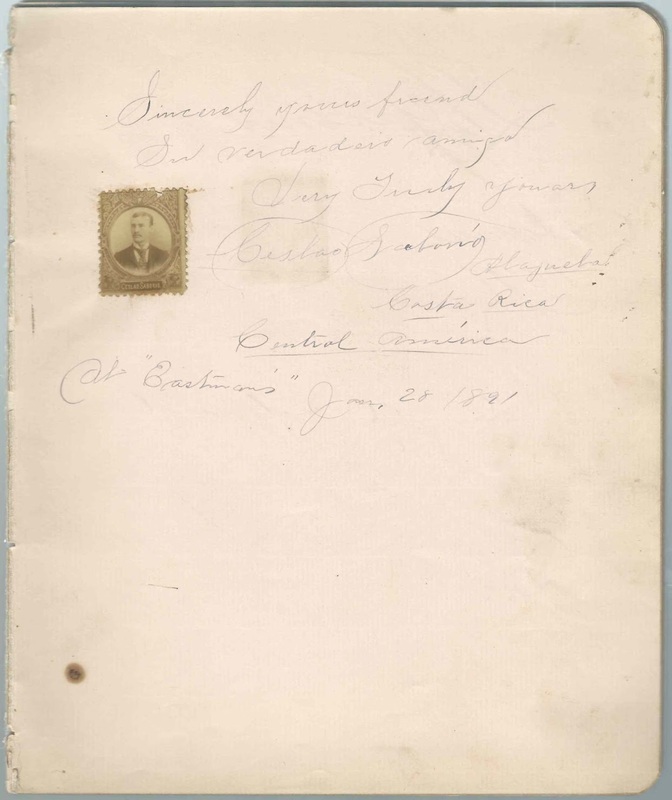 1891 autograph album with sentiments left by students and faculty at Eastman National Business College at Poughkeepsie, New York. 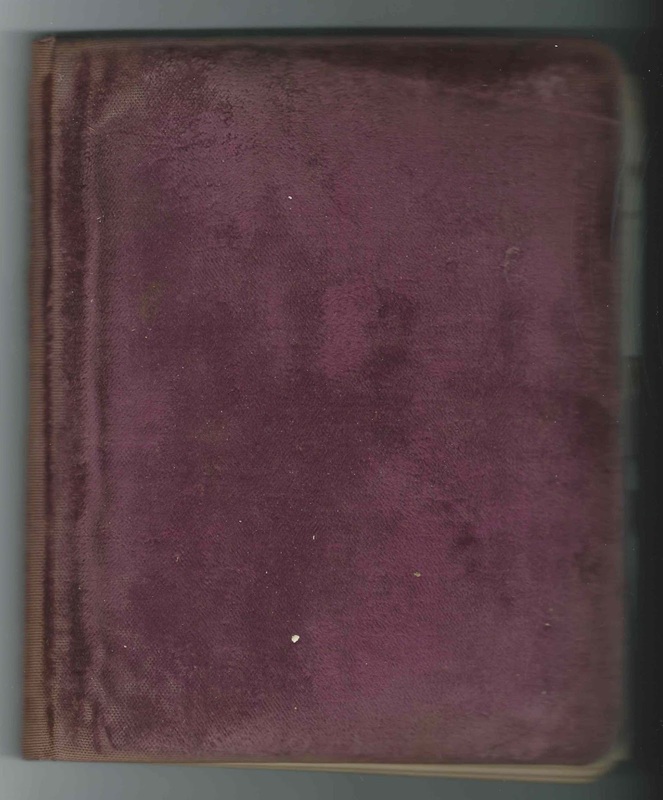 The album measures approximately 8-1/4" x 7" and contains the autographs of 104 students and faculty, though a few of them inscribed both a group and another page. The owner may be one of those who signed a group page of 1891 graduating students on February 24, 1891. Some of the signers affixed photograph stamps of themselves. C. H. Peix, Jr., Danbury, Connecticut. Charles H. Peix, Jr.
? C. Armstrong of Syracuse, New York; first initial might be I or F or S or ? Interestingly, two people, C. H. Fredericks and Effie C. Quackenbush, who shared a page with M. G. Chase of Cimarron, New Mexico, noted that they were the album owner's neighbors at Chester, New York. Because of reference to Chester, New York, I believe the album owner was likely Frank M. Cox, who was listed in the 1860 Census of Chester and the 1865 New York Census. 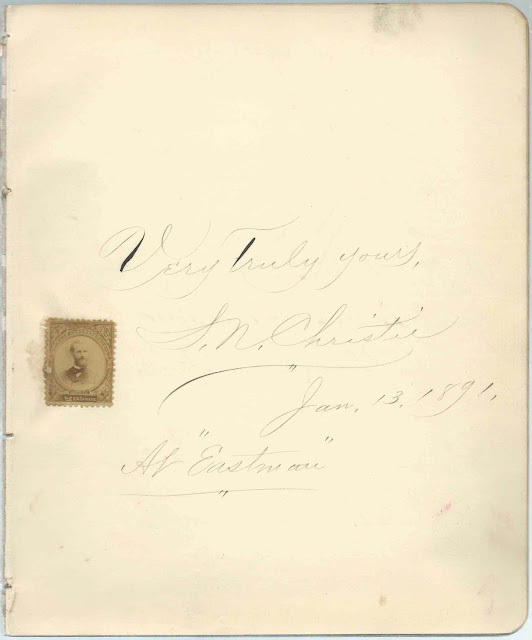 One faculty member who inscribed a page was Maine native Samuel Nutt Christie, son of Thomas Christie and Statira (Nutt) Christie. Thomas and Statira, New Brunswick and Maine natives, respectively, eventually moved to Pennsylvania, where their biographies appear in the Commemorative Biographical Record of Central Pennsylvania, published in 1898. One student from Costa Rica and another from Japan, signed pages. 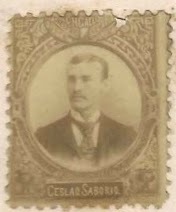 Ceslao Saborio of Alajuela, Costa Rica, inscribed a page on January 28, 1891 and affixed his photograph. I wish the Japanese signer, whose name looks like K. Haji kano, had affixed a photograph stamp so I'd have a better idea of the spelling and syntax. C. S. Walker of London, England, shared the page and affixed his photograph. 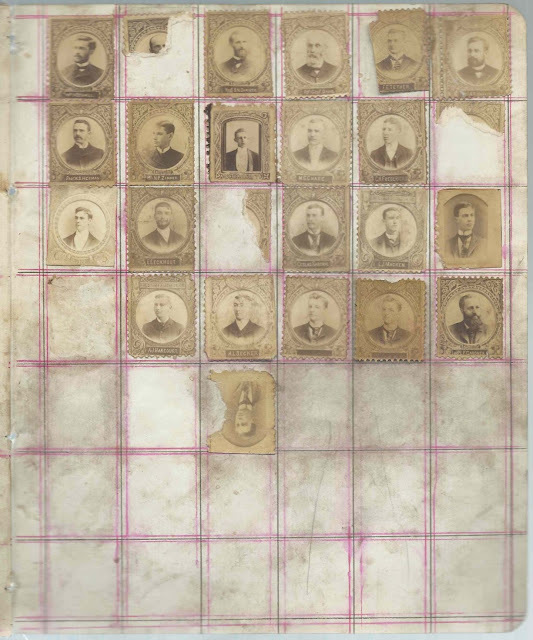 The back end paper has over 20 photograph stamps affixed, but some are damaged. There were more originally. Two photographs show men who did not sign pages in the album: A. J. Harcourt and H. L. Decker. If you have another theory as to the album owner's identity, or information on any of the signers listed below, please leave a comment or contact me directly. K. Haji kawo of Japan, signed at Eastman on February 9, 1891; not sure of name. Shared the page with C. S. Walker. James E. Aitken, signed at Eastman in 1891; he affixed his photograph stamp. A. C. Armstrong of Syracuse, New York, signed at Eastman on January 23, 1891. Shared the page with W. E. Carey. M. Belle Bates of Setauket, New York, on Long Island, signed at Eastman on January 18, 1891, presumably a boarder at #10 Conklin Street. Shared the page with J. A. Sankey. Charles A. Boyce of South New Berlin, New York, signed at Eastman on February 14. 1891. Shared the page with A. J. Follett and P. R. Layton. H. Clay Burns of Churchville, Virginia, signed at Eastman, on February 11, 1891; possibly Henry Clay Burns. Shared the page with N. N. Gregory. W. H. Butts of McIntyre, New York. Shared the page with A. Sturgess. W. E. Carey of Gilbertville, Massachusetts, signed at Eastman on January 16, 1891. Shared the page with A. C. Armstrong. C. Howard Chandler of Boston, Massachusetts, signed at Eastman on January 26, 1891. Shared the page with E. R. Whitney. M. G. Chase of Cimarron, New Mexico, signed on February 25, 1891. Presumably Mason G. Chase. Shared the page with C. H. Fredericks and Effie C. Quackenbush. M. F. Clark of Parksville, New York, signed at Eastman on February 14, 1891; "Not your Valentine". Shared the page with R. W. Moorhead. A. B. Collier of Kenton, Ohio, signed at Eastman on January 19, 1891; he affixed his photograph stamp. Shared the page with J. a. Wagner. Laura May Craft of Bridge City, New York, signed at February 25, 1890 at Classical & Home Institute. Shared the page with Charles J. Johnson and Laura May Craft. Mr. and Mrs. Craft of #10 Conklin St., Poughkeepsie, New York, signed on February 25, 1891. Mrs. Craft affixed her photograph stamp. Mr. and Mrs. 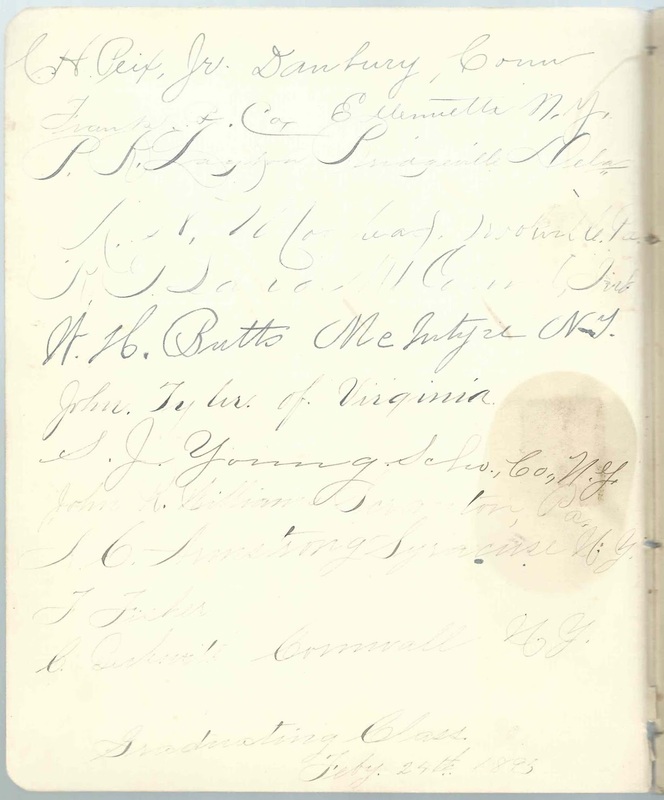 Craft may have operated a boarding home at #10 Conklin Street, as several female signers mentioned that address. Shared the page with Sidney Miller. P. A. Curtado, signed at Eastman College in 1891; not sure of initials or surname. Shared the page with L. J. Macken. W. C. Dale of Madera, Pennsylvania, on Clearfield County; signed at Eastman on February 18, 1891. Shared the page with H. E. Hitchcock and Louis Grundy. Professor George F. Davis, signed at Poughkeepsie, New York on January 12, 1891. He affixed his stamp photograph. H. L. Decker. He didn't inscribe a page in the album, but his photograph stamp is affixed to the back end paper, along with many others. James J. Donohoe of Hinsdale, Massachusetts, signed at Eastman on January 19, 1891. Shared the page with D. E. Goldsmith. 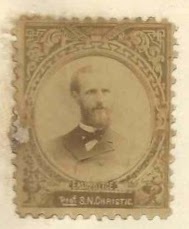 Emile Eckhout of Paris, France, signed at Eastman on January 21, 1891; he affixed his photograph stamp. Shared the page with I. Munzeshimer or Munzesheimer. J. B. Evans of ?, Alabama, signed at Eastman College on January 26, 1891. Town looks like Uarcoa ? Shared the page with Prof. George A. Rockwood. A. J. Follett of Adams, Massachusetts, signed at Eastman on February 11, 1891. Shared the page with P. R. Layton and Charles A. Boyce. 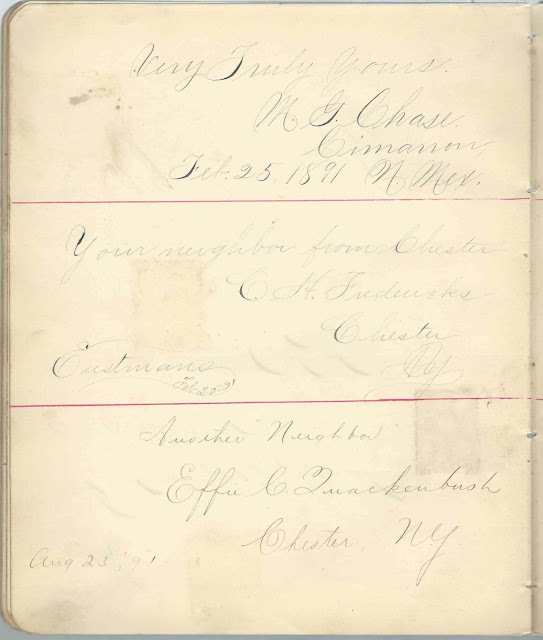 C. H. Fredericks of Chester, New York, signed at Eastman on February 25, 1891. His photograph stamp is affixed to the back end paper along with many others. Mentioned he was the album owner's neighbor from Chester. Shared the page with M. G. Chase and Effie C. Quackenbush. Professor L. F. Gardner, signed at Eastman College in 1891; he affixed his stamp photograph. LeVergne F. Gardner. Shared the page with A. C. Macdonald.
? P. Geehan of Helena, New York, signed at Eastman on February 18, 1891. Shared the page with R. G. Laird. A. G. Gillespie of Bangor, Maine, signed at Eastman's in 1891; album owner's roommate. He was Augustus G. Gillespie. Shared the page with C. J. Webster. D. E. Goldsmith of Centre Moriches, New York, signed at Eastman on January 26, 1891; possibly David E. Goldsmith. Middle initial might be C. Shared the page with James J. Donohoe. Louis Grundy of Paterson, New Jersey, signed at Eastman on January 30, 1891. Shared the page with H. E. Hitchcock and W. C. Dale. Professor W. B. Hamill of Poughkeepsie, New York, signed on January 23, 1891. William B. Hamill. He affixed his photograph stamp. Shared the page with R. W. Judd. A. J. Harcourt. He didn't inscribe a page in the album, but his photograph stamp is affixed to the back end paper, along with many others. A. R. Haskin of Poughkeepsie, New York, signed on February 25, 1891. Professor Albert R. Haskin. W. J. Hayes of Suffolk, Virginia, signed at Eastman, on January 26, 1891. He affixed a stamp photograph. W. S. Herman, signed at Eastman on January 21, 1891. Shared the page with James E. Aitken. Kate Joerissen of Ilion, New York, signed at Eastman on January 18, 1891; "#10 Conklin", which may have been a boarding home operated by Mr. and Mrs. Craft. Shared the page with A. J. Doremus and Hattie M. Bates. Carl A. Joerissen of Ilion, New York, signed at Eastman. Shared the page with Charles H. Peix, Jr.
Charles J. Johnson of Utica, New York, signed at Eastman on January 20, 1891. Shared the page with J. H. White, Jr., and Laura May Craft. I. H. Johnston, Jr. of Charleston, Illinois, signed on February 18, 1891. Presumably Isaiah Hugh Johnston, Jr.
R. W. Judd of Salem, Ohio, signed at Eastman on February 25, 1891. Presumably Ralph Webster Judd. Shared the page with Professor William B. Hamill. P. R. Layton of Delaware, signed at Eastman on January 26, 1891. Presumably Philip R. Layton of Bridgeville, Delaware. Shared the page with A. J. Follett and Charles A. Boyce. C. F. Loomis of Bolton, Connecticut, signed at Eastman on January 23, 1891. Shared the page with J. F. Magee. A. C. Macdonald, signed on January 15, 1891 at Eastman. Shared the page with Professor LeVergne F. Gardner. L. J. Macken of Hinsdale, Massachusetts, signed at Eastman on January 19, 1891. He affixed his photograph stamp. Presumably Luke J. Macken. Shared the page with P. A. Curtado. J. F. Magee of Athens, New York, signed at Eastman on January 19, 1891. Shared the page with C. F. Loomis. W. S. McCarroll of Arkansas, signed at Eastman College on January 20, 1891. Shared the page with S. J. Young. A. A. McPhelemy of Danbury, Connecticut, signed at Eastman on February 25, 1891. Presumably Ambrose Andrew McPhelemy. Shared the page with N. P. Zimmer. Note of January 19, 2016: see a reader's comment for more information on Ambrose Andrew McPhelemy. There was also an Arthur A. McPhelemy, but the reader notes that he died in 1888. Sidney Miller of 218 E 58th St., New York City, signed at Eastman on January 17, 1891. Shared the page with Mr. and Mrs. Craft. R. W. Moorhead of Brookville, Pennsylvania, signed at Eastman on January 26, 1891; he affixed his photograph stamp. Shared the page with M. F. Clark. 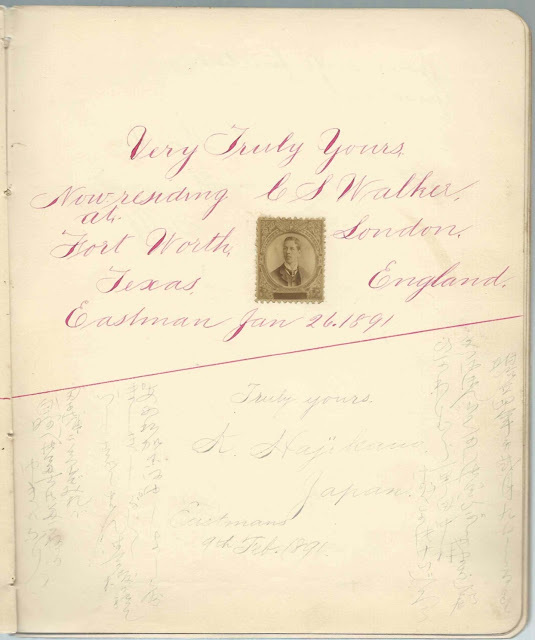 I. Munzeshimer, or J. Munzeshimer or Munzesheimer of Texas, signed at Eastman. Middle initial A or S. Perhaps Isidore Munzesheimer. Shared the page with Emile Eckhout. C. H. Peix, Jr., of Danbury, Connecticut, signed at Eastman on January 26, 1891. Charles H. Peix, Jr. He affixed his photograph stamp. Shared the page with Carl Joerissen. Effie C. Quackenbush of Chester, New York, signed on August 23, 1891. Like C. H. Fredericks, she called herself the album owner's neighbor. Shared the page with M. G. Chase and C. H. Fredericks. Ceslao Saborio of Alajuela, Costa Rica, signed at Eastman on January 28, 1891. He affixed his stamp photograph. J. A. Sankey of Potters Mills, Pennsylvania, signed on the "Last day at Eastmans" February 11, 1891. Shared the page with M. Belle Bates. Frank Shufelt of Copake, New York, signed at Eastman on January 26, 1891. Shared the page with J. T. Sullivan. W. C. Stephenson of Pittsburg, Pennsylvania, signed on January 21, 1891. He affixed a photograph stamp. Shared the page with George O. Rasbach. A. Sturgess of Wessington Springs, South Dakota. Shared the page with W. H. Butts. J. T. Sullivan of Corning, New York, signed at Eastman on January 29, 1891. Shared the page with Frank Shufelt. F. E. Tether; stamp photo. Floyd Edward Tether. He affixed his photograph stamp. John Tyler of Radford, Virginia, signed at Eastman, on January 21, 1891. Shared the page with Joseph Heidel, Jr.
C. M. Van Aken of Catskill, New York, signed at Eastman on January 26, 1891. Presumably C. Melvin Van Aken who founded the cooperage company C. M. Van Aken. Shared the page with W. Hartwell. J. A. Wagner of Dover, Ohio, signed at Eastman on February 12, 1891. Mentioned 217 Mill St. Shared the page with A. B. Collier. C. J. Webster of Walton, New York, signed at Eastman on February 11, 1891. Shared the page with A. G. Gillespie. E. P. Welch of Westerly, Rhode Island, signed at Eastman on January 28, 1891. He affixed his photograph stamp. J. H. White, Jr., of Paterson, New Jersey, signed at Eastman on January 30, 1891. Shared the page with Charles J. Johnson and Laura May Craft. E. R. Whitney of North Fairfield, Ohio, signed at Eastman on February 18, 1891. Shared the page with C. Howard Chandler. S. J. Young of Schoharie County, New York. Shared the page with W. S. McCarroll. I love this web site! It is very interesting to me. I have two relatives who went to Eastman. My Great Grand Father William C. McPhelemy and His younger brother whom you have listed as A.A. McPhelemy. ( presumably Arthur A) There was an Arthur but he died on 29 Jan. 1888. I'd like to guess that it was Ambrose Andrew McPhelemy. He was intricately involved in the family business, born in 1872 and died in 1925. I am so excited. Every time I get one clue it potentially, can help me identify more family in pictures that i have, that remain unidentified. All the Best to you and I would love to collaborate with you. Thanks for the kind words, Linda! Some people roam antique malls looking for identified photos - they can sometimes be had for $1 each. Then research them using free resources online and blog about them or add them to a social media group. A fun and fulfilling hobby that doesn't have to be expensive. Autograph albums are now very expensive, at least on eBay, but, as you can see, they are a gold mine of history and genealogy. Thanks for adding your comments about A. A. McPhelemy - I added a note to the blog post directing people to your comment. Is this your only book from Eastman? Like I said, my Great Grand Father William Campbell McPhelemy also attended Eastman! Thank you so much for your quick response to my comment from yesterday!